Drug addiction is a sweeping epidemic in our society today. Every 19 minutes a baby is born addicted to drugs. This is why I started "The Love Project: Helping Heroin Babies get Addicted to LOVE." I want to raise awareness for these forgotten victims. Many times opiod addicted babies have no one to hold them as they are going through withdrawal because their mothers are unable to care for them. One of the best ways to comfort an infant going through withdrawal is to swaddle them. That is why I am asking for people to donate funds to purchase new, 100% cotton receiving blankets. I will take each blanket and heat-press a personal logo on them reminding not only the babies but the mothers as well, that they are loved. These blankets will be given to babies born addicted to drugs in hospitals and care facilities. Blankets will be sent home with the babies as a lasting reminder that they are loved. All money donated on this page will go to the purchase of "The Love Project" receiving blankets for drug addicted babies. Please like and share "The Love Project: Helping Heroin Babies get Addicted to LOVE." Facebook Page. -Share “The Love Project” on public community pages and with Media outlets around the nation. Who do you know that could share this important cause on a grander scale? -Do you have knowledge of how to become a non-profit or have the ability to help in this area? (please PM me about this). -Would you/your organization be willing to pay for my ad to bring awareness for this cause? This ad will go in an International publication (PM me for details). -Do you have access to discount or bulk baby blankets that you could donate or know a company or organization who might? -Are you part of a group that would like to collect receiving blankets to donate to this cause? This might be your School, Office, Hospital, Club, Church, etc. -Do you or your organization host a public event that you could encourage those in attendance to donate a blanket? Sports Event, Company-wide Training, Vacation Bible School, Golf Outing, Women’s Retreat etc. I am open to any ideas that you might have to help more babies! Please feel free to contact me! Thank you for your continued support! Together we can help more babies get addicted to Love! Big thank you to WCPO 9 On Your Side News for featuring The Love Project! To View this story, click the link below. I am beyond blessed to have met these wonderful children that want to make a difference in the world. 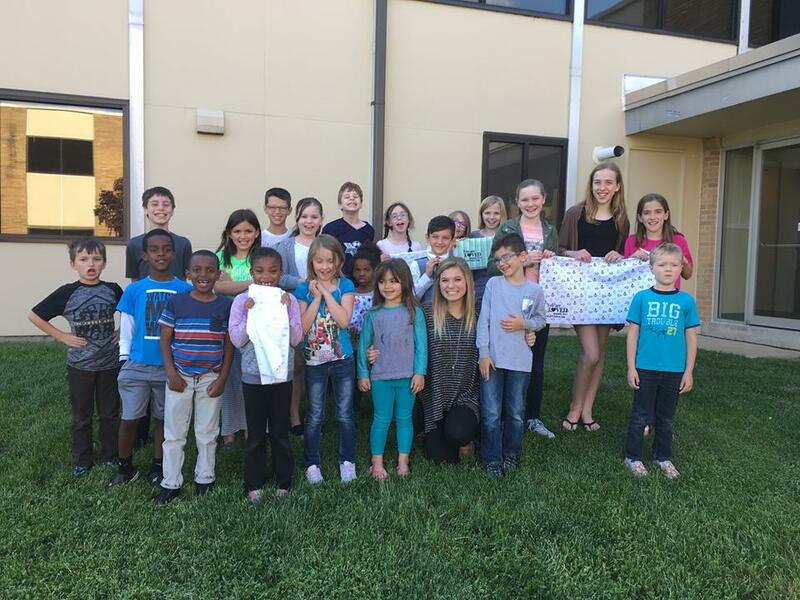 After sharing The Love Project with them, each child made their own blanket to donate to my project. What an amazing group of kids. Thanks everyone. Exciting day learning more about Brigid's Path from the founders Deanna Murphy and Jill Kingston. Brigid's Path provides inpatient medical care for drug-exposed newborns and I was able to give the first 100 "Love Project" Blankets to them! Brigid's Path is the first facility of it's kind in Ohio. 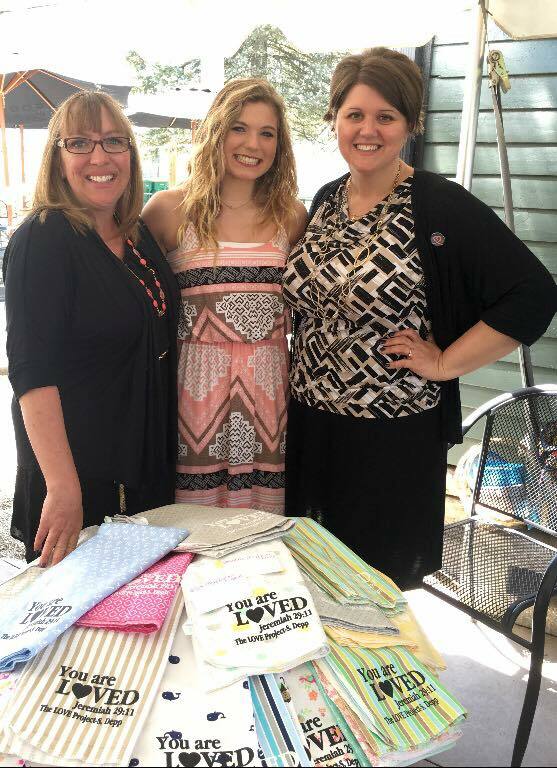 I was honored to get to speak at their event and am excited to work with them to "help heroin addicted babies get addicted to LOVE." Please check out Brigid's Path and please continue to share my video/project/page with others! This is a great cause. God Bless you. I wish I could donate more..
What a beautiful ministry, Sidney. Well done!